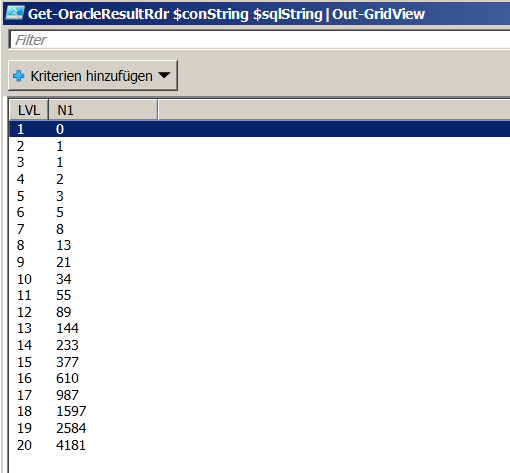 Summary: Guest blogger and Windows PowerShell Guru Klaus Schulte talks about using Oracle ODP.NET and Windows PowerShell to simplify data access to Oracle databases. Microsoft Scripting Guy, Ed Wilson, is here. It is early in the morning in Frankfurt, Germany, and the Scripting Wife and I just returned from Prague where we had a wonderful time visiting with one of the new Windows PowerShell MVPs David Moravec. David is a super nice person, and he took the time to show us around his lovely city. I must have taken nearly 500 pictures—won’t know until I upload them to my portable USB hard drive. Anyway, we feel really blessed to have had the opportunity to spend the day with such an interesting person. And this brings our three-week tour to a close (in just a few hours). We have some time in the Frankfurt airport before our flights. This is a good thing because the Frankfurt airport has lots of things to do and to see. It is like a shopping mall with airplanes attached to it. Because I knew that things would be a bit confused today, I asked my good friend and PowerShell GURU Klaus Schulte to supply a guest post for today. With no further ado, here is Klaus. By living in a networked world, with Internet access everywhere, information retrieval is often a snap. You don’t need to go to the living room and search through encyclopedias or dictionaries any more to find information—clicks on the touchscreen of your smartphone may do the job in seconds! Right, everything has changed, but behind the nice-colored icons, most of the information retrieval is still relying on some old-fashioned techniques—called databases. At the company I work for we definitely know that at least this will not change in the next couple of years. In fact, it is crucial to get at some database information, even in scripts, to retrieve information regarding the current workflow, the status of individual tasks, and error messages indicating a flaw in the workflow. By using Windows Powershell and ADO.NET, we are in a comfortable situation that let us query a database on the fly to get the required piece of information necessary for further processing. Unlike Cmd.exe but like VBScript, we could use ADODB for that job, or we could rely on ADO.NET and the System.Data namespace to query databases. Even for our Oracle databases, the .NET Framework did support us by the Microsoft System.Data.OracleClient, which has been part of the .NET Framework ever since but now it has been marked as deprecated and will no longer be supported in future Framework versions starting with .NET Framework 4. Non-Microsoft products are available, of course, and a free Oracle version ODP.NET has been around for some years, too. But we always used the Microsoft provider because it has been part of the Framework anyway and it worked fine out of the box. But, nowadays, as most companies are migrating to 64-bit systems, another level of complexity has been added to the provider choice: You have to pay attention to the combination of installed Oracle clients and data providers on the machines your company is running because the Microsoft and the Oracle provider rely and cooperate with an installed Oracle client version on each workstation and this can be a 32-bit or a 64-bit client. You can’t easily provide an application that works in both worlds … you have to know which operating system you are running! Some non-Microsoft products don’t need the Oracle client installed and can communicate directly with Oracle. Note You can walk through this article using the unmanaged Oracle.DataAccess.dll without any changes (except for the name of the dll). And if you use the Microsoft System.Data.OracleClient you will also be able to follow me with very little effort! Even if you use another RDBMS, chances are that you can easily build an analogue scenario for your database. You can download a complete package called ODAC ( Oracle Data Access Components ) from Oracle, which includes developer tools for Visual Studio, Data Provider for (ASP) .NET 4 and (ASP) .NET 2, Database Extensions for .NET 2, and Services for MTS, Provider for OLE DB, Objects for OLE, ODBC driver, SQL Plus, and the instant client. Everything can be installed via the Oracle Universal installer, which is part of the pack, too. 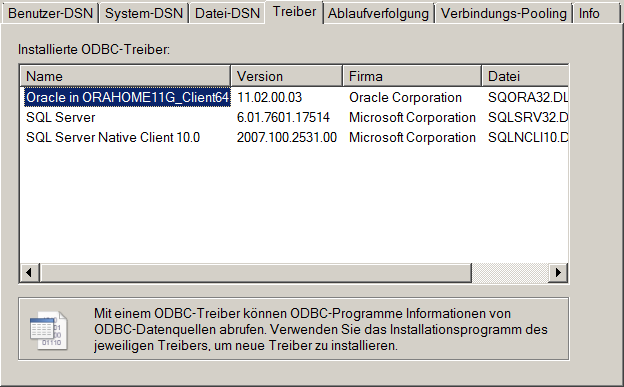 I won’t recommend using the ODBC driver unless you have to because it is the slowest connection method. OLE DB might deliver an acceptable performance for your applications, but if you can choose freely, the Oracle Data Provider for .NET should be your first choice. As I mentioned above, the Oracle Instant Client is part of the ODAC and there is one thing I want to point out here: You have to install an Oracle Client for each of data access method. Also, be aware that the standard Oracle Client may be a large piece of software! Depending on the functionality needed, you may have to dedicate over 500 MB on each workstation. The Instant Client is an improvement, which reduces the size of the client to about 100 MB as there are only a couple of binaries (DLL) delivered in this package, which can be copied to each workstation without the need of any further Setup. However, it only contains the most basic functionality where additional add-ons might be needed. A major problem is that depending on your software mix, it might be necessary to install the 32-bit and the 64-bit versions of the client, which is a challenge on its own, if you have to make both versions available on one machine. Another option that offers .NET access to the database is: Just use the Oracle Data Provider for .NET, which can be obtained as a separate download from Oracle called ODP.NET and is available in a 32- and 64-bit versions. This was the way I preferred to query our database up to now. A couple of weeks ago, Oracle released the public beta of an ODP.NET version that makes life much easier now. When the download is complete, just unzip the file ODP.NET_Managed_1120350_Beta.zip to a location like C:\Oracle and start using the Oracle.ManagedDataAccess.dll. ODP.NET runs on x32 and x64 Windows. You don’t have to install an Oracle client. The size of ODP.NET is less than 7 MB. By now, there is no production version of ODP.NET available. The current beta has some limitations compared to unmanaged ODP.NET. You still need the unmanaged Oracle.ManagedDataAccessDTC.dll if you need to work with the Distributed Transaction Coordinator. These issues should be gone with the production version that should be available next year. We can use this DLLon Windows 7 and Windows Server 2008 or later with Microsoft .NET Framework 4 installed (the same requirements as Windows Powershell 3.0). Of course, it will be reasonable to have access to an Oracle database server (10g R2 or higher), too. Now we want to execute some SQL Server commands against database. The next step is to create a connection to the database. Here you need to supply credentials to access the database and schema as well as a host and service name. Next, you check if the connection can be opened! Interestingly, you can see that the properties except for the connection string are already preset: The standard connection timeout is 15 (seconds), the data source localhost/XE is taken from the connection string, a statement cache size is preset to 0, and the connection state is still closed. The properties DatabaseName, HostName, InstanceName, ServiceName, and ServerVersion have values now. And the StatementCacheSize has been updated to a value reported by the server, too. It is mandatory to catch errors here as it is somewhat likely that you won’t get connected on the first try because you may have the credentials or other parts of the connection string wrong, or the listener or the database may not be running, or network problems might exist. We can never rely on a successful connect. The CommandType is Text by default meaning that you will be able to directly supply a select command. Note Other enumeration values are StoredProcedure and TableDirect. Here we just produce a greeting message, which can run on any schema because it uses the build in table “dual”. There is just one piece missing: How do you execute the command? You need a reader object to read the result set returned from the database. But it’s crucial to have the connection open before you can execute the reader! If this is all you need, we have to close the connection in the end! It says: GetString, not GetInteger, or something else more appropriate! Well, it is obvious that we could use the To… functions to convert the resulting decimal value to some other sub datatypes. I won’t discuss further details here, but you may be asking yourself this: Why do we have to deal with this proprietary OracleDecimal type instead of just using the simple and straight forward Decimal type? Well, there is one reason in the world of databases that is incompatible to the type system of most other programming or script languages and always requires special treatment: Null values! In most traditional programming languages special functions have been introduced to test for nullable values. That’s where it makes perfectly sense to use the special Oracle data types even if it is a bit more effort to extract the value! That said, our new query does work for us, but hey, we only received one value where three values should be available: intCount, strCount, and datCount! Best of all: You can even use Out –GridView instead of Format-Table –AutoSize, if you want to display the data even more nicely. 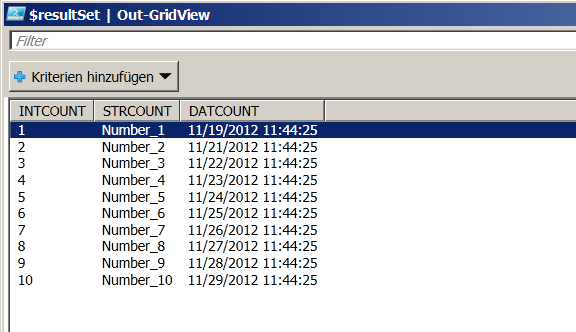 Additionally, the filtering and sorting capabilities of a data grid view are now for free. I did exchange the data reader with a data adapter, which has a Fill method that can automatically populate a dataset or data table with the results of the select statement. This is at least a timesaver writing the script code. A rather interesting question came to mind now: Is it a timesaver regarding performance, too? Well, we probably should do some testing now. But measuring the execution time of the select command is most likely faulty if we just execute one select. Maybe 10 selects would provide a better measurement basis and retrieving more than 10 rows, maybe 100, might be better, too. To do so, we are getting a bit more Windows Powershell-stylish now and encapsulate the two scripts in functions. We omit the Format-Table statement in the end and return the whole $resultSet as result of the new functions. But we should definitely consider some more changes. The new versions of the script might look even better if we parameterize the select statement and probably the connection string, too! Before we do this, I have to admit that even then, we have still some things to consider that would be nice to have: Querying a database using a fixed select statement might be more or less “sub optimal”. Additionally, the use of a constant connection string is not the best solution. There are some further topics that could have been addressed like using parameters in select statements, executing queries that don’t return result sets or issuing other statements that don’t select data at all. Nevertheless, we’ll concentrate on the connection string and the select command here, and ignore other potential improvements. I added rudimentary error checking and a very simple checking on both input parameters, too. We just set the whole function inside a try-catch-finally block to catch and report any errors that are likely to happen during database operations. The “ValidateScript” instruction is used to check that the connection string includes at least the “data source” property and that the select string contains the word “select.” Additionally, I made both parameters mandatory without supplying defaults, which wouldn’t make too much sense in my opinion. Unbelievable! And definitely wrong, as I can tell you from my experience! 8.4921[ms] is not a realistic time. But I can explain to you that each database relies on heavy, well elaborated, and highly tuned caching algorithms that prevent a reasonable timing if you loop through the same statement. The statement is preparsed and cached, the previously calculated execution plan is used again and if result set caching is available, the execution may be skipped at all, and the old result set will just be returned to the client. These data are more realistic! But still the data adapter is ready in 0.3 seconds whereas the reader operation lasts 2.27 seconds. Is it real that the data adapter received the results 7 to 8 times faster than the reader? Very unlikely, I would say. So, let’s read the data without processing them at all. Well, this is not too bad at all! It seems to be even faster than the preceding measurement, which is, of course, hardly possible. It is more or less a result of inaccurate timing for such fast operations. But, in general, it indicated that the behavior didn’t change significantly. Even if we consume the data, we are still pretty fast getting at the results! So what else could be the reason why? That’s it! At least partially. We found the slow operation: Adding members to the PsCustomObject seems to be very time consuming. Comparing it to the original 2.27[s] we can imagine that the time to add up the $results to the $resultset adds another 0.3 seconds penalty to the execution time and you might have already observed it: We can get rid of this extra time. WOW! The fastest solution so far—it may be a tie between this and the second solution because we can’t know exactly if the timing is good enough. Note I could also eliminate the assignment to $result and return the object directly in the last two cases, which won’t change the execution much. I just left it there for a better comparison to the first two solutions where we have to use the $result variable. The last thing I want to do now is to generalize the solution a little further! We still have used a special query up to now that returns three values in each row with fixed data types: OracleDecimal, OracleString, and OracleDate. This is very special and the question arises if we can modify the solution further to accept other types of data and more or less than three columns per row. Of course, we can but as a constructor of a [pscustomobject] with variable initial values is not available, can we still profit the fastest solution or will we have to go back to the Add-Member solution, which is very slow? This function doesn’t depend on the type and returns an object. Returning a pscustomobject based on the hashtable $result works. This way we can use the fast constructor but have a variable initialization. Sounds fine, but hey, the result isn’t that cute. In fact, we are back to where we started from: We have a time of over 2 seconds again. A little additional overhead would be OK, if we can generalize queries. But is it really true that we are back to where we started from? I really thought so at first but investigating things further I discovered that the loop construct followed by the pipe is quite slow. This is quite acceptable for a generalized solution! Again, it wasn’t a fault of the database that returned the results too slow, it was a problem with my script that slowed things down. Something to remember! If you are not convinced that it really does what it is supposed to do, we can supply some alternative queries just to present the results. Here is result of a query that returns the Fibonacci numbers and the depth level of the recursion (or just a counter if you prefer that ). But wait! Why exactly could the order of the columns not be preserved? The loop that returns the columns read by the data reader did return them in the correct order because we did define the order by the parameter $i in the call to $rdr.GetOracleValue($i), so it has to be right! But there is one flaw in the script code: Adding elements to the hashtable $result doesn’t preserve the order in which they were added. Adding the [ordered] tag as part of the creation of the hashtable does do the job. So reordering the result by Select-Object is no longer needed. Both $da and $dr are arrays of objects, but $dr is a PsCustomObject, whereas $da is a DataRow object. … and think about the DataTable used to retrieve the results from the database, it might become quite clear that we are not dealing with an Oracle specific object. System.Data.dataTable is a .NET object that doesn’t know of OracleDecimals, OracleStrings, or an OracleDate. It just returns the corresponding .NET types. Back to our original question: Is the data adapter faster than the data reader? Yes, it looks like that. And that is an observation that is even opposite to some articles I have read before. We had 0,292 seconds for the data adapter, and now we still have 0,373 seconds for the data reader, which is small, but in recurring queries and maybe if larger result sets have to returned, significant difference! If you think: Why should I bother? I will always use the data adapter that returns a ready to use dataset or a data table with less coding in a smaller amount of time? First of all: I am not sure if it may not be possible to tune the data reader further with special database parameters like the fetchsize to make it even faster. Secondly, and more importantly, if you have to return a large amount of rows things may change—especially if you can’t keep the dataset in memory anymore. The data reader can be used to serially progress each data row, the data adapter has to fetch all the data before you can progress any row. One other thing to remember is that you have a permanent connection to the database while you use the data reader to fetch each row. You have to manually open and close the connection before you start reading the data and after you finished to do so. The data adapter does this behind the scenes in its fill-method for you. It only connects to the database to populate the data set or table used to keep the results of the query. In fact I did check with the still available, though deprecated, version of the Microsoft implementation of the Oracle client. If you still want to use it, you may have to load the assembly if you are using the .NET 4 client profile. The results have been pretty much the same as those that we have seen before using the managed Oracle data provider! Note Exchanging the Oracle Managed data provider with the unmanaged version doesn’t change much either. Lastly, we could still revert to the something “completely different”: We can still use ODBC or OLE DB to query our database! Using the Oracle OleDb provider requires that it is registered on your local machine. Usually it should have been registered during the installation process of the ODAC if you don’t uncheck that component, but I already have noticed that this is not always true. Oracle offers a 64-bit version of the OleDb provider, which is something that Microsoft doesn’t offer. 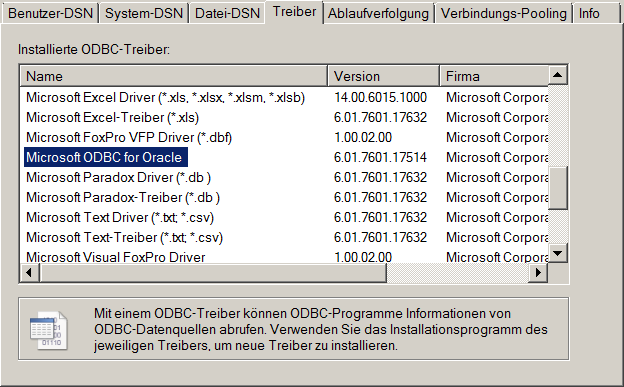 If you want the 32-bit version, you have to download the ODAC package from Oracle. (if your operating system has been installed to drive C). The 64-bit version would have to be registered with C:\Windows\System32\regsvr32.exe OraOLEDB11.dll, and you might have set the working directory to d:\Oracle\Odac64\oledb\bin\ before, if you had unzipped it there. Now we can work with the 32- and/or 64-bit versions of Windows Powershell without problems! Otherwise, we may have encountered error messages reporting that the Oracle.OleDb provider is not registered on the local machine. That’s all! If we clear the Oracle cache and run the usual timings, we can see that using OleDb is a little bit slower that our previous solution. Being COM-based might be one reason for that because we have another level of indirection between the database and the client, where a lot of processing, especially type conversion may have to take place. The timing results are quite the same. But remember there is no 64-bit version of this provider available. 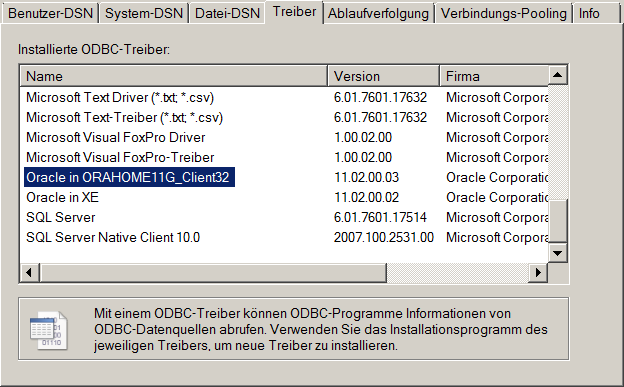 The highlighted driver is the Oracle 64-bit ODBC driver that I did install on my system before. You can download it as part of the 64-bit ODAC. The 32-bit version is, of course, part of the 32-bit ODAC download. Additionally, we have to change the validation of the parameter $conString because we did expect a “Data Source” component as part of the connection string. Another subject to change is the call to $rdr.GetOracleValue($i). Because there is no such function! We have to use $rdr.GetValue($i) instead. The results are pointing into the right direction: The ODBC driver solution is the slowest way to retrieve the data. But, if you just retrieve 10 thousand rows with three columns you can probably use any of these technologies without having to wait significantly longer! A real life test with more data will have more significance, of course. We just scratched the surface as we did query some data from our Oracle database and we are done! We didn’t update, delete, or insert any data. And we didn’t issue DDL commands, used stored procedures, ref cursors, parallel queries, and so on. This might have to be explored in another article or even more. But, we have learned a little bit about fetching data from Oracle now by using the new managed data provider and we have seen that performance problems may not be buried in database execution time only, but in the way we try to retrieve the data and return it to our application. The topmost XE is the network alias defined to connect to the database. If you need to use this tnsnames.ora file, it has to be found by the Oracle client. A well-known algorithm is used to search for this file (“Sqlnet.ora”, “Listener.Ora” and other configuration files may be there too). Without all the details, it is important to know that the lookup procedure includes the path of the executable, other locations in the order specified by the PATH variable, and a path pointed to by the TNS_ADMIN environment variable. Klaus, thank you for a comprehensive and educational blog post. I really appreciate you taking the time to research and to write this article. Join me tomorrow as I talk about using Windows PowerShell to discover to hidden WMI classes so I can inventory my HID devices. It is fun, I promise.